3 Beds 2 / 0 / 0 Baths 1,608 Sq. ft. Description: Lots of beautiful southwest style in this adobe town home. Interior & exterior walls are all adobe. Lots of room for your family with 1,608 sf, 3 bedrooms and 2 full baths. Relax in the great room and enjoy many cozy nights by the wood-burning kiva fireplace. All solid wood doors, tpo roof, granite counter tops, new synthetic stucco, new refrigerated air/ heating unit, freshly painted and all stainless steel appliances. 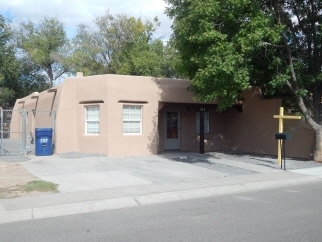 Walking distance to Railrunner and minutes to Albuquerque. Close to all city conveniences.